(Nanowerk News) There are good bacteria and there are bad bacteria — and sometimes both coexist within the same species. Take, for instance, Pseudomonas aeruginosa, a microbe common in soil and water. This bacterium has been found to colonize medical equipment in hospitals and clinics around the world, and can live benignly in healthy individuals. But the bug poses a risk to those with weakened immune systems, and can turn pathogenic in patients with cystic fibrosis, forming thick layers of mucus in the lungs. However, determining whether a bacterium is harmful typically requires growing cultures from samples of saliva or blood — a time-intensive laboratory procedure. Now MIT researchers have developed a new microfluidic device that could speed the monitoring of bacterial infections associated with cystic fibrosis and other diseases. The new microfluidic chip is etched with tiny channels, each resembling an elongated hourglass with a pinched midsection. Researchers injected bacteria through one end of each channel, and observed how cells travel from one end to the other. A new microfluidic technique developed by MIT researchers to quickly sort bacteria within the same strain could improve monitoring of cystic fibrosis and other diseases. The cells were propelled by a technique called dielectrophoresis, in which voltage exerts a force on a particle. But depending on the cells’ exterior composition, or phenotype, they either passed through the channel’s narrow section or were trapped at the opening. Cullen Buie, the Mitsui Career Development Assistant Professor of Mechanical Engineering at MIT, says a bacterium’s reaction to voltage serves as a “fingerprint” for its phenotype, which in turn is a clue to how virulent that particular bacterium can be. Buie, MIT graduate student William Braff, and colleagues Korneel Rabaey at Ghent University, in Belgium, and Dana Willner and Phil Hugenholtz at the University of Queensland, in Australia, have published their results in the journal PLOS ONE ("Dielectrophoresis-Based Discrimination of Bacteria at the Strain Level Based on Their Surface Properties"). Buie says the outer surface of a cell can tell you a lot about its activity — or, in the case of bacteria, its potential danger. For instance, P. aeruginosa can express hairlike extensions, or pili, on its surface that help the organism swim through its environment and grab onto other cells, forming large, thick films of mucus. To distinguish among bacterial subtypes, the team first fabricated a millimeter-thick chip, which they then etched with multiple tiny channels. The widest portion of each channel measures 500 microns, about five times the width of a human hair. The channel’s constriction is a much narrower 50 microns. The researchers obtained ordinary strains of P. aeruginosa, along with mutant strains that were missing certain genes required to make dangerous biofilms. The team fed the cells through each channel, applying a low voltage. The resulting electric field was much more intense at the narrowest part of each channel, creating a dielectrophoretic force that repels certain cells, depending on their phenotype. From their experiments, the researchers found that their device is able to distinguish benign cells from those that are better able to form biofilms. The team has yet to test the device using samples that are not pristine: The collected bacteria came from pure cultures, not bodily fluids. Once the researchers make that leap, Buie sees many clinically important applications for the device. “A potential implementation could be to run this assay, which tells you, ‘Are the bacteria shifting towards more dangerous strains, or are they still less virulent?’ — and maybe tell you that before the patient starts to exhibit some symptoms,” Buie says. The team envisions the device may one day be incorporated into a portable, disposable system for clinical use, providing fast results without lengthy lab work. Scientists often have to grow several rounds of bacterial cultures before they can determine strains’ phenotypes — but over successive generations, bacterial properties may change. 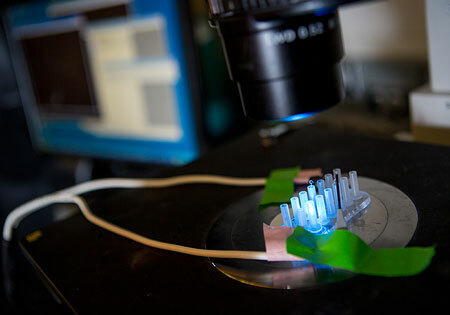 The team’s microfluidic device, in contrast, would require no time-consuming culturing, which, in theory, would provide a more accurate picture of how bacteria actually behave in the body.